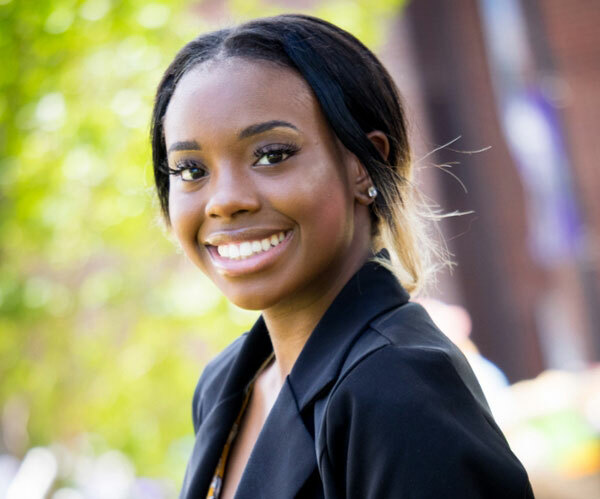 Amani Baker, majoring in air traffic management, works in MGA's Career Services office and is active in student government and with the Campus Activities Board. Full Name: Amani Love Baker. High School: Newton College and Career Academy and Newton High School. Her high school activities included Skills USA (president), Baby Rams; DECA; placing third in regions; Heels in Motion, Beta Club; Fellowship of Christian Athletes; Teen Advisory Council; Georgia Prevention Project; and Kick the Habit. Family: Lakeshia Johnson (mother), Micah Henderson (brother,) Autumn Philpot (best friend). Employment: "I am a full-time student and I am also employed at the Office of Career Services on the Cochran Campus." Degree Objective: Air Traffic Management. Primary Campuses: Cochran and Eastman. Activities: Senator, Student Government Association; resident assistant; president of Campus Activities Board; Sisters Attaining Self Success member; the first Miss Old Gold for the Upsilon Psi chapter of the Alpha Phi Alpha fraternity. Career Goals: "I want to become an air traffic controller because I want a career that will challenge me every day, plus give me the ability to support a family." She chose Middle Georgia State University because … "It offered a program for air traffic management and provided the opportunity for me to work on an associate's degree while still being on track for a bachelor's degree. I researched Middle Georgia State and then took a tour of the School of Aviation on the Eastman Campus. I loved the atmosphere of the campus and was impressed by the faculty and staff." The greatest thing she discovered about Middle Georgia State was … "This University is filled with opportunities. There are so many opportunities for students to gain experience in many things and leave a legacy." Her greatest academic experience as a Middle Georgia State student has been … "Excelling in my online classes. Before starting Middle Georgia State I was used to the classroom setting of high school. Online classes require a different level of discipline and structure that I was not used to. I've made my way through it by goal-setting and time-management. Now I do not mind online classes because of the flexibility they offer." To her, “greatness” means … "Reaching your full potential. Greatness means to set goals and to achieve them. Greatness means to constantly strive and to never give up. Greatness means developing qualities like leadership, peacemaking, and gaining knowledge." In five years … "I plan to be finishing up at the Federal Aviation Administration academy in Oklahoma to become a certified air traffic controller. I'd like to start work in North Carolina, but I'll be prepared to live anywhere."